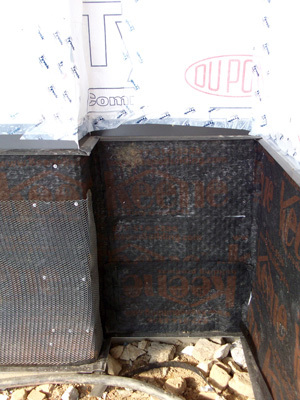 The Driwall Rainscreen 020-1 created a ¼” airspace behind the stone to allow for drainage and v entilation. Masonry veneers such as stone are often referred to as reservoir claddings since they are highly absorbent and can hold large amounts of moisture. Therefore, it is essential to provide not only a way for liquid moisture to drain from the wall, but also a way to dry out the saturated stone. 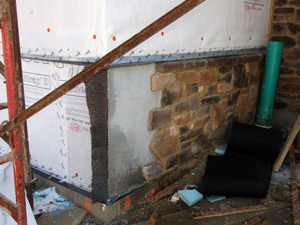 The Driwall Rainscreen creates a space to allow air to flow behind the stone veneer. The ventilated cavity dries out the stone and preserves the look and longevity of the rustic stone cladding.